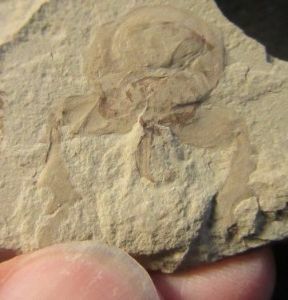 LARGE BEETLE HEAD AND APPENDAGES - EOCENE COLORADO.U.S.A. LARGE BEETLE HEAD AND APPENDAGES - EOCENE, COLORADO.U.S.A. Small piece of buff siltstone. One surface shows the head of a metallic wood boring Beetle.From the front of the head protrude a pair of pincers and at least one of the feeding appendages. Very unusual preservation. Quite bizarre. 'Raydome' locality near Douglass Pass, Colorado, U.S.A.
Matrix : 5.5 x 3.7 x 0.2 cm.